Given our recent erratic weather which is culminating, as I write this, into a major snow storm accompanied (just to make it more exciting) by strong winds … Mother Nature has had/is having a high degree of influence over how I spend my time. In order to create a Post under these conditions ….. books! 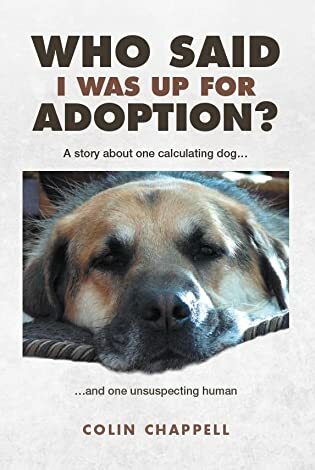 “Who Said I was up for Adoption?” is a book covering the “trials and tribulations” of the first 18 months of Ray and I living together. Having been bitten by a dog many years ago, I was very cautious about making any “dog adopt decision”, but Ray took charge and adopted me! The full story is in the book. “Just Thinking” is a book of simple poetic verse about various aspects of life, most of which have a basis from my own experiences. I have never been too enthusiastic about poetry because I often had no idea what it was about. Was it indeed about anything, or just an excuse to string a lot of flowery adjectives and adverbs together? My poetry is much less complicated, and reflects so many aspects of life As long as you have a grasp of the English Language, you will understand them! “The Odessa Chronicles” is a book of short stories targeted at children in the age range of 4 to 104! Think of a Barn Owl with an “attitude”; a cat who only lives to eat and sleep; a Jackalope whose main task appears to be mediator and uses his magic when necessary, and a man who finds the three of them living on his farm. Carolyn Shelton and I co-authored this book, and it was our goal to incorporate humor and many “life lessons” into the stories. More information on these books can be seen by clicking the appropriate book cover over to the right (may have to scroll). They are all available direct from the Friesen Press Bookstore, and also from the usual on-line retailers, and the best place for reviews is at amazon.com. All three books are available in Hard Cover, Paperback and eBook formats. I would like to suggest that you stay wherever you are in the warm and order yourself a book or two or three … while I go out and start shoveling the snow before it becomes a major challenge. We are forecast 25-30cm of it together with high winds. Should make for some interesting drifts! Have read all three books. Each is great in three different ways. Just let me know when the next book is ready! Amazon said I could place the order now and they would let me know when the book comes in, Prime shipping would take 2 days after they get it. OK, if it’s POD and they’ll have it “back in stock” soon, I will go ahead and order it. Thanks. It looks to me like a ploy to get you to buy a more expensive copy! Loved the link! Ray did display typical GSD traits when in the shelter in that he could not handle the enclosed space; the constant strangers staring at him, and had nowhere to hide. He had to be medicated to prevent him from losing all self-control and possibly do serious injury to himself. In contrast however, he did get attached to a number of people there! I have nothing but praise for the Humane Society trainers. They worked with him for 4 months before posting his adoption notice. In fact, coincidentally, they picked him up in Oct 2012, which was the same time that I started making inquiries about possibly adopting a dog. The full story is of course in the book! All 3 are wonderful books to warm your heart while its cold outside! Stay warm with some hot coffee and don’t get lost in the drifts! I want to see a picture of the snowman when you are done. More snow=more snow shoveling exercise. You must be very physically fit by now.